When you have a furry family member, it is important to pet proof your home to ensure it is safe for your new pet. While you can never completely prevent every situation unless you put your dog in a sterile bubble, which is really no fun for you or him, covering the following areas of your home will cut down on the potential for bad situations. This is the first thing that most pet parents think of, as these are the most common things for pets to get into. Put all medications, even over-the-counter meds, in a secured cabinet or drawer. Keep household chemicals up high in a cabinet or other secure location where your fur baby can’t get to them. Cosmetics and nail polish should also be stored in a locked place. Even seemingly harmless food items, like a canister of flour or shaker of salt, can be potentially life-threatening if ingested in large quantities, so make the most use of your cabinets and pantry as you can. No one likes to come home after a hard day at the office to find a brand-new pair of leather shoes or a lovely leather handbag torn to shreds by emerging puppy teeth. However, while these items are expensive to replace, they can pose a health threat to your pet. Shoelaces can get wrapped around inside tiny tummies and intestines, or cause a choking hazard. Handbag hardware and leathers can also pose a choking hazard. Keep as many enticing, chewable items out of reach whenever possible. Your closet is a great place to hide these things. This is another attractive nuisance for pets. Cords and wires just look yummy, but can pose choking or electrocution hazards. Keep cords out of reach if you can. Most of the time, this is not feasible. You can purchase devices to keep cords stowed away so they aren’t as attractive to your pet. A lot of dogs and cats are great escape artists, especially when they are very young. Don’t leave your pet unattended around open windows; dogs and cats can break through a screen in nano-seconds. You can also purchase child-proofing devices that will keep your pets inside and allow you to keep your windows open to let a breeze flow through. When you open doors, it may be a good idea to keep your pet leashed or secured in another room so he can’t slip out the door into the big, scary world outside. If you work outside the home or your pet spends a lot of time home alone, an alarm system is a great idea. Just before Thanksgiving, a home in the sleepy southern Illinois town of Eldorado burned and was a total loss, but thanks to an alert from the alarm system, the home owner was able to get home from work in time to save one of the family dogs. An alarm system can give your pet a better chance at survival in the event of an emergency, as help will arrive sooner than without an alarm. A fenced yard is the best idea for dogs and dog owners. However, don’t rely solely on your fence to keep your pooch safe, as dogs can easily escape them. Even more of a concern are the people outside the fence. Dog thefts are on the rise, and many people with nefarious intentions are stealing family pets from yards. Keep an eye on your dog when he’s outside playing, and go out with him whenever possible. After taking these steps to pet proof your home, you will be one step closer to being ready for your new furry family member. 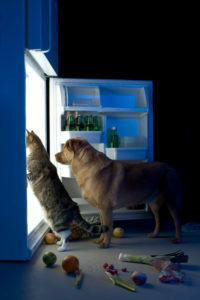 Now that you have made your home safe for your new pet, you can focus on their nutrition. By adding a high quality pet supplement to their daily diet, you can ensure they are getting the vitamins and minerals their body requires. For more pet friendly topics and adorable pictures, check out https://www.facebook.com/NuvetLabsOfficial/. We believe that maintaining a safe and healthy place for your dog to live in should be a top priority. In order to do so, his home and supplies should be checked to ensure they are still in good shape. When is the best time to do this you may ask? You don’t have to wait until springtime. You can start as early as the fall season! Here’s a list that will guide you in accomplishing this task. The season’s strong winds will definitely cause a great number of leaves to accumulate in your yard. These may obscure things that are dangerous to your dog, such as sharp objects or debris. Grab your rake and remove the leaves from your yard so you are able to detect these objects as soon as possible. Check if your plant bulbs have been properly secured and buried. Plant bulbs, such as tulips, are usually planted during the later parts of summer or early periods of fall so that they will be in full bloom when springtime arrives. However, dogs can accidentally ingest these bulbs. It is important to check if the bulbs have been properly secured and buried in the ground. Keep a close watch on your dog, especially if they like digging. An alternate solution would be to plant the bulbs in areas where your dog cannot access them. Call the vet immediately if you think your dog has ingested a plant bulb. You should never run low on your supply of dog food or pet supplements. This will spare you from the hassle of braving a snow storm or any kind of bad weather just to buy your dog his food, and ensure your supplements are delivered before you run out. Check your dog’s supplies. Determine if they are damaged or if they are functioning well. Damage in your dog’s supplies, such as holes in his bed or loose parts in his toys, may cause danger to him. For example, he may accidentally ingests the stuffing of his bed or the small parts of a toy. If the supplies are damaged, fix and give them a good wash or better yet, replace them with a new one. The weather may cause your dog’s leashes and ties to become less sturdy. Inspect them to see if damages are present which may cause them to easily break. This may cause your dog to be able to run free from your yard and get lost. 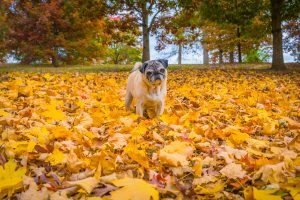 Fall is a good season to create a new habit like encouraging your dog to exercise or introducing him to a great dog supplement such as NuVet Plus. Here at NuVet Labs, our mission is to make sure our furry friends live in a healthy and secure environment. Our passion for pet well-being inspired us to develop human-grade pet supplements to support the pet from the inside. Our canine and feline supplements consists of the highest quality ingredients, manufactured in an FDA-registered laboratory. This could give your dog a more positive and healthier lifestyle. Continue reading Autumn Safety Tips for more seasonal safety information. For humans, the holidays are a wonderful opportunity to get together with friends and family. It’s a time to celebrate and enjoy wonderful food. It is important that in the busy days and hours that ensue, dogs are not forgotten about. While our canine companions enjoy the festivities as much as we do, it is easy for them to become injured. Here are some holiday safety tips to help ensure dog safety throughout the holiday season. It is nearly everyone’s favorite season. It’s filled with eggnog, the general holiday spirit, and the chance for a fresh start in the New Year. When decorating, however, make sure that nothing is left within the dog’s reach. This includes ornaments that can be broken, wires that can cause electrocution, and lit candles that can be knocked over. Watch out for seasonal plants, such as holly and mistletoe, that can cause sensitivities. Make sure the Christmas tree (if applicable) is secured so it cannot be knocked over by a curious pup. Many people enjoy inviting guests over during this festive time of the year. Most pet owners know that chocolate and anything sweetened with xylitol are no-nos. However, it is also important to ensure all food trays are out of reach, garbage cans are secured, and leftovers are put away promptly. Make sure all drinks are secured and out of reach as well, especially those that contain alcohol. It’s probably also a good idea to offer feline guests the opportunity to escape the excitement to prevent over stimulation. On New Years, avoid confetti, which can injure animals if ingested, and noisemakers, which can damage sensitive ears. If gift giving in the household includes feline family members, make sure all toys are high quality and indestructible. It is important that no small parts can be torn off and act as a potential choking hazard. For human presents, make sure that all wrapping paper and ribbons are cleaned up promptly to prevent choking. Similar to other holidays, it is critical around Valentine’s Day to watch out for potential ingestion of chocolate and treats sweetened with xylitol. Also be aware of any alcohol left unattended or spilled and not cleaned promptly. Since many people give and receive flowers around this holiday, be sure they are de-thorned and away from animals. Romantic, candle-lit dinners are also popular. While celebrating love, be sure that all candles are extinguished when unattended, even if just for a minute. If anyone is considering giving a puppy as a romantic gift, it is always best to pick out the actual animal together to prevent homing difficulties. Adopting an animal is not a decision that should be taken lightly. Fireworks are the signature celebratory festivities of Independence Day. They are also one of the biggest hazards for dogs. When using any sparklers or personal fireworks, make sure all pets are far away to avoid injuries. Keep any lighter fluids out of reach as some can be problematic if ingested. Resist the urge to decorate canines with light sticks and other decorations. Leave dogs at home if attending a fireworks show. The loud noises can be terrifying and traumatizing for furry friends. Like the rest of the summer, it is also important to keep insect repellents and sunscreens out of the dog’s reach. Do not apply any to the animal unless it is specifically marked as safe for dogs and cats. Similar to Valentine’s Day, chocolate and sweets are hazardous to dogs. Trick or treat baskets should be kept out of reach. Dogs should also be kept away from trick or treaters coming to the door, as they can be overwhelmed by the constant stream of strangers. It is very easy for them to dart out the door while their owners are busy handing out candy. Many owners enjoy dressing up animals in the spirit of the holiday. However, it is important to only do this if the dog actually enjoys the festive outfits to avoid causing undue stress. When selecting costumes, make sure it does not constrict movement in any way. Avoid accessories that can be bitten off and become potential choking hazards. When setting up Halloween decorations, again watch lit candles and oils to avoid accidents. Similarly, keep any wires or electronics out of reach. Food is the primary danger for dogs when Turkey Day comes around. Make sure that canines have no access to bones, which can splinter or become choking hazards. Avoid offering dogs any food that has been seasoned, as a variety of spices can cause stomach issues. This includes food that falls to the ground during the meal. For this reason, it may be best to have dogs rest in another room during the big Thanksgiving dinner. Of course, make sure that any food offered to the dogs has been fully cooked. Holidays are always fun to spend with friends and family, both those with two legs and those with four. 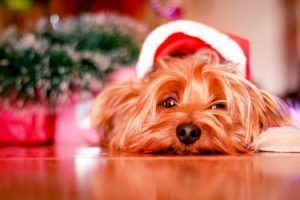 By following these holiday safety tips and keeping an eye on canine holiday celebrators, you can help avoid incidents that can otherwise cast a shadow over the festive spirit. At NuVet Labs, we are dedicated to pet safety and health. Visit NuVet on YouTube to see how we support pet health with high quality, natural, human-grade supplements. Learn more about NuVet by going on the NuVet Labs LinkedIn page.